The World Chess Olympiad in Baku has drawn to a close. Russia's men's team won bronze medals. The women's team, three-time Olympic champions, has ceded their title, having finished at #4. The President of the Russian Chess Federation, a well-known entrepreneur, has made his coaching debut. He shares the tournament results and his impressions in an interview with SE. - Can you tell us why you decided to lead the Russian national men's team? - Following my election as the President of the Russian Chess Federation I attended the Chess Olympiad in Tromsø in 2014. It was a shame that our men left without any medals, and I wanted to rectify the situation. All the more that I am chess coach by training, a professional. It was then that the idea was born. - Now that the team has returned home with bronze medals, how would you evaluate its performance? - I consider their performance satisfactory. This is better than the result in Norway, we have moved up one spot. But a team with a rich tradition such as ours always strives to be #1. Therefore, personally I feel that only a gold medal could be considered a total success. - You hired the renowned expert Boris Postovsky as an advisor. - Boris Postovsky is a legendary man. He is now in his eighties but one can't help but envy his energy levels. He was a great Soviet chess coach who had led our national team to gold medals multiple times in the past. As someone who worked with many world champions, from Botvinnik to Kramnik, his knowledge is invaluable. He advised us really a lot, and I believe it is important to tap the experience of people whose contribution our country was so proud of in the past. - It is not easy to work with a team of star players. The 14th World Champion Vladimir Kramnik, the challenger Sergey Karjakin, three-time World Blitz Champion Alexander Grischuk, the European Chess Champion Ian Nepomniachtchi and the reigning Russian Champion Evgeny Tomashevsky. How was your relationship with them? - The relationship was good. It was a great honor for me to work with outstanding chess players. We have established a team relationship based on mutual trust and respect. After all, we worked together towards a single objective, and nobody spared himself. - Even the team's appearance has changed. 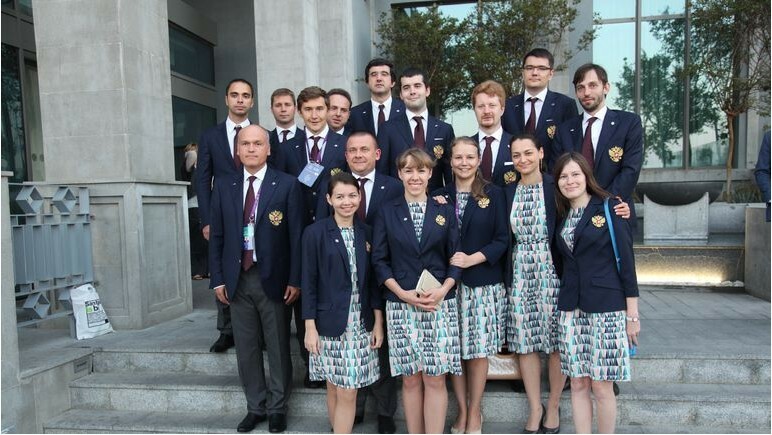 The team members wore very beautiful outfits with the national coat of arms on the chest. Did you initiate this innovation? - It was a common decision. The uniforms emphasized the fact that we are a team. And we are proud to represent our country. - Let's start with the fact that all the guys came out of the opening game rather efficiently. Tomashevski got an advantage. He could maneuver pawn "g" to fix the game on two results. That was a solid winning position. But Evgeny was in no hurry to make that decision. In the meanwhile, Kramnik confidently made a move for a variant with the black pieces, which he knew for certain would result in a draw. We were absolutely not worried about him. At the same time, Nepomniachtchi seized the initiative and was already playing to win. Grischuk missed an attack but disposed of a forced perpetual pursuit and could immediately finish the game in a draw - his rival's dream. At that particular moment we stood a chance of winning against the Ukrainians. But games are played to the very end. Grischuk eventually forced a position and surrendered. Ian won, but Tomashevski wished to win the match at any cost, made a gross mistake as a result, and the match was lost. As surprising as it may sound, we were negatively affected by our thirst for combat, excessive feeling of responsibility and the desire to play to win even when the position did not allow it. After that our team did not lose a single match but that was only enough for the third place. - But you could win against the Americans in an individual duel? - We probably could but the game ended in a draw (2-2). Karjakin had an overwhelming advantage on the board and on the clock. The coaches provided him with a very reliable variation. But the thrust was not powerful enough, and in the end Caruana managed to escape. Had Sergey won, everything would have been be different. But the exhaustion from the efforts manifested itself by the end of the game. For example, Nepomniachtchi made inhuman efforts, pulling the entire team along with him and delivering a phenomenal score (7 out of 7 possible) before the match against the United States. But then he just got physically tired and flinched in the battle against So. The only player who showed a powerful and confident game throughout the tournament in Baku, and won brilliant victories in different styles, was the 14th World Champion Vladimir Kramnik. He showed true class and confidence, and cemented the entire team, having become its leader. - The strongest chess players of different styles play on the first board. Everyone plays his best game against the challenger, trying to exhaust him. Sergey was physically very tired. He fought selflessly but did not have enough energy. I am sure that Karjakin and his coaching staff have drawn the necessary conclusions. I think that technically and in terms of the opening game, Sergey is ready for the match, but he should strengthen himself physically, actively engage in sports. We productively cooperate with the Ministry of Sports, and Minister Vitaly Mutko has been helpful, personally attending one of the challenger's training sessions. - Also, our national team improved its overall ranking during the tournament. That did not happen even once in history. It proves that our team played just great. But indeed, competition is extremely tough nowadays. The Chinese team, Tromsø 2014 Olympic champions, did not even make it to the top ten. This fact speaks for itself. And who could possibly expect Norway, Turkey and Poland to make it there instead of China? Everyone has learned to play well today, and it's becoming ever more difficult to win. No wonder the United States team has hired two foreigners in the last two years - the Italian Caruana and the Filipino So. - What can you say about the women's team? - They have done very well and are worthy of admiration. I especially want to acknowledge the work of Sergey Rublevsky. I understand him so well now! He has been in this job for many years and twice led the team to victory at the Olympiad. - It all started pretty well. The girls were very confident. Pogonina had a big advantage. Kosteniuk clearly led the black pieces towards a draw in a game vs. the World Champion Hou Yifan. Gunina obtained a small positional advantage. Goryachkina was on a good track with the black pieces too. The plan was simple: win on the last board (Pogonina) and finish all games in a draw. Gunina, by the way, had a good score against her opponent and stood a chance of defeating her. However, we have what we have. Our team lost 1.5-2.5. The girls fought tirelessly until the last game though. - As the head coach, I did my best to help the team. I served them tea when they needed it. We were one happy family, and I am proud of my chess players and the coaching staff.